Just in time for next week’s 10th anniversary of Halo 3: Live Halo Or Die Trying, the folks at gaming gear makers Jinx have launched a new line of official Halo clothes and things. 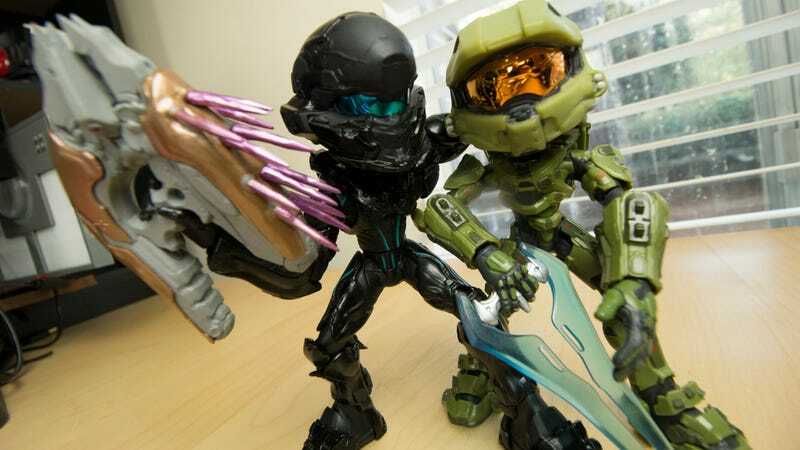 Things like these six-inch vinyl figures of Battle Damaged Master Chief and Night Ops Spartan Locke, for example. Designed by Jinx and officially licensed by the company that probably wishes it still had Bungie all to itself right now, the two figures look to be the first in a line of vinyl toys featuring skinny people in power armor with very large helmets. These two just went on sale today for $24.99 apiece. While they look like stylized statues, these figures actually have points of articulation, making them very mildly poseable. Arms rotate at the shoulders, elbows and wrists, and the head is on a ball socket, though the ginormous helmet and bits of armor about the back and shoulders limit movement. Just enough head movement to have a little sass. I kind of like the default pose here, with Master Chief’s hand held out like he is begging for change. It has potential for shenanigans. Big fan of shenanigans. Or he just wants some skin, my good man. One fun game to play with people photographing these toys is to blow the images up and try to see how messy their office is right now by looking at the reflection in Master Chief’s helmet. While Spartan Locke is perfectly content with his needler weapon (and who wouldn’t be? ), Master Chief can swap out his pistol for an energy sword. So shiny. So appealing. If you are into Halo or video game clothing in general, check out the rest of Jinx’s Halo line. I am particularly fond of the UNSC Army and Bomber jackets. Just keep in mind that a Jinx 3XL isn’t the same thing as a Walmart 3XL. Check those sizing charts, people. Now where were we? OH MY GOD LOCKE PUT THAT DOWN!